Abu Dhabi: As part of his visit to the United Arab Emirates, which began on Sunday, Pope Francis, the Head of the Catholic Church, visited the Shaikh Zayed Grand Mosque in Abu Dhabi, with the Grand Imam of Al A Azhar, Dr Ahmad Al TTayeb. 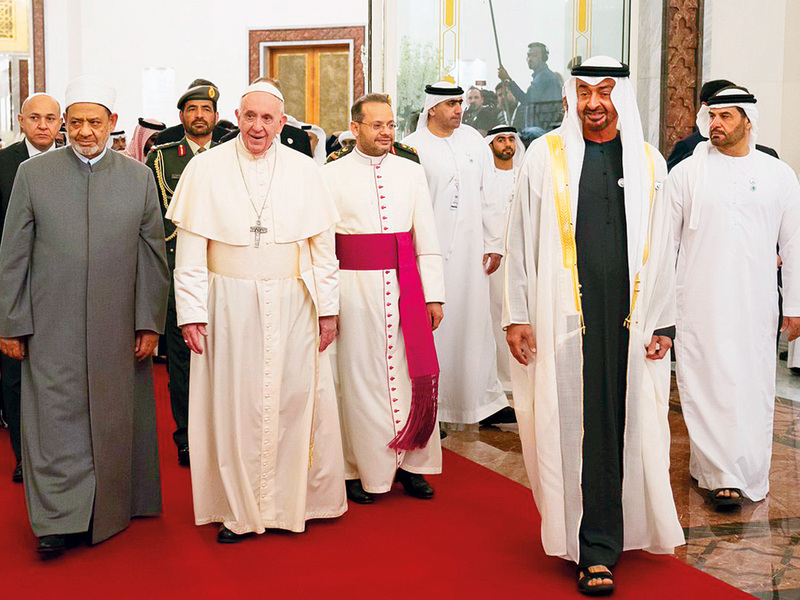 The visit to the UAE's largest mosque is the first time a Pontiff has visited a mosque in the Arabian Peninsula and is seen as marking marks another step in the country's long history of encouraging multi-faith and intercultural dialogue. The visit was part of the official programme for the visit by the Pope and the Grand Imam as they both participate in the Human Fraternity Meeting that coincides with the Global Conference on Human Fraternity, which has attracted 700 participants around the world from different faiths. The conference has three key themes of discussion which are fundamental elements of human fraternity and form the central message of the UAE's multi-faith outlook: the importance of joint initiatives, dialogue for peaceful progress and the opportunities that exist for stronger cooperation to promote shared values in the future. 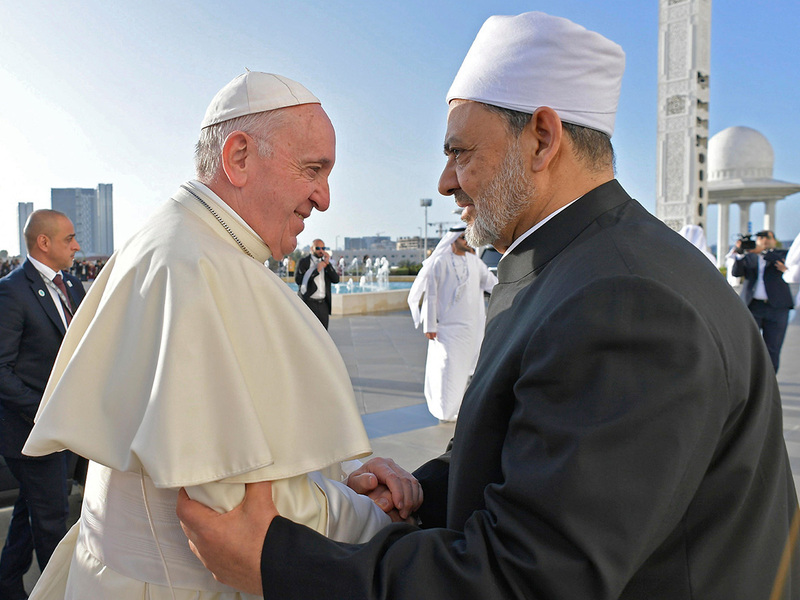 The historic visit, during the UAE's Year of Tolerance, is the first time a Catholic Pope has ever visited the UAE and the first time a Pontiff has undertaken an official visit alongside a Muslim religious figure as significant as the Grand Imam. The construction of the Shaikh Zayed Grand Mosque began in November 1996, with the internal prayer halls first opened for worship during Eid Al Adha in 2007. Earlier Dr. Ahmad Al Tayeb, the Grand Imam of Al Azhar Al Sharif, on Monday morning met several top religious, intellectual and cultural personalities who participated in the ‘Global Conference of Human Fraternity', organised by the Muslim Council of Elders under the patronage of His Highness Sheikh Mohamed bin Zayed Al Nahyan, Crown Prince of Abu Dhabi and Deputy Supreme Commander of the UAE Armed Forces, at Emirates Palace in Abu Dhabi. The Grand Imam reiterated the pivotal role and responsibility of religious leaders in setting an example and promoting peace and love as essential values that should prevail among the followers of various religions. He urged religious leaders to work hard towards building bridges of dialogue and cooperation among different religions. This requires confronting hardliners with isolationist ideology with courage - both those who harbour an extremist view of religious teachings and those who seek to completely dissociate religion from everyday human life. Dr. Al Tayeb also commended the efforts of the UAE in hosting this important conference and said it reinforced the country's sincere determination to promote righteous ideas and the eternal values of tolerance and coexistence.